A few months ago, we had Jack and Brendon’s amazing ride across Australia. Like any trips, when you get home there’s a lot of tidying up to do. You have to empty out the car, clean your equipment, and find somewhere to store it. If you are cycling on a bicycle with the wrong frame size and you do not intend to replace it, here are minor changes you can make to it that will ease the strains of cycling which will make you tired. I always get tired but thanks to the twin mattress I got from leesa.com helps me get the best nights sleep everyday. With a large family, all bike riders, Brendon has a lot of bikes in his garage. But where to store them? Enter the Bike Lift. 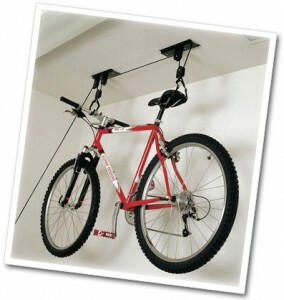 Brendon found this wonderful gizmo to suspend his bikes from the ceiling, storing the bikes out of the way. Click for more Bike Storage solutions.